6 home runs in 18 at-bats is very, very good (and also undoubtedly a bit lucky). 4 robberies in 18 months is very, very bad (and also very unlucky). I do appreciate the coincidental symmetry of this though. Puig has actually moved once during this string of robberies, so two different homes have been robbed. As the Yahoo article notes, criminals are clearly targeting Puig on game days. 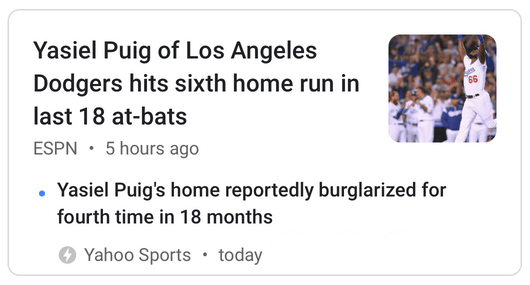 I missed it last year, but while the Dodgers were losing the decisive game 7 of the 2017 World Series, Puig’s San Fernando Valley home was also being burgled. That’s a real double whammy. Update (October 26th, 2018): It appears Puig’s tormenters have been caught.